One look at the whimsical cover illustration makes it clear that this is going to be a fun read, not a dry discourse on biochemistry. Basically, The World Turned Upside Down, is the story of how we obtain energy from our environment, told by a talented teacher who explains it so even those of us who don’t know much chemistry, “can see the beauty in the life machine.” Sadly, it is also an expose of the irresponsible behavior of those in the medical establishment, the very people we trust to give us good advice, to tell us the truth and, at the very least, to do no harm. It is at once a memoir, a manifesto, and a call to arms about what must be done to save ourselves and heal our nation. Dr. Richard David Feinman is a Renaissance man, one with expertise and knowledge in many fields, including philosophy, music, history, gastronomy, and art (his avatar is a self-portrait), as well as biology, chemistry, and thermodynamics. His writing is enriched by his wide range of interests and accomplishments. He first became interested in nutrition while studying the scientific literature in preparation for teaching metabolism classes to medical students at SUNY. He discovered that something was terribly wrong and found himself plunged headlong into a world of shoddy science, self-deception, and scandal as bad as any in the entire history of medicine; a perfect storm of flawed research, assumptions accepted as proof, and science corrupted by grandiose egos, greed, and special interests. The fox was not just guarding the hen house, but selling rotten eggs for profit. Dr. Feinman has been a leader in the grass-roots campaign to spread the message about bad science, statistical manipulation, vested interests, and the behavior of medical authorities who stubbornly cling to outdated beliefs that perpetuate the status quo. The tide has finally turned and the war is essentially over. We can no longer be fooled so easily. Change came from the bottom up—from word of mouth, popular books, independent documentaries, blogs, and social media and from a few brave men like Dr. Feinman, who refused to be silenced or to cave in to pressure even when it cost him personally. Read this book and join his rag tag band of rebels. 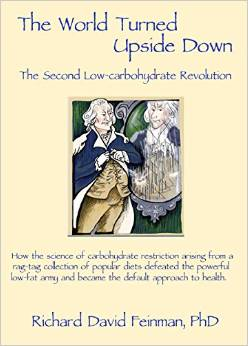 There is a lot of work yet to be done to reverse the damage inflicted by the misguided war on fat and to prevent more casualties. Nutrition Science, Richard David Feinman. Bookmark.